2013 SCI Championship Race winner Briana Gess aims to make it 2 in a row! The Race Assignments for Saturday’s adidas Shore Coaches Invitational have been released and they are Here. Listed in chronological order. 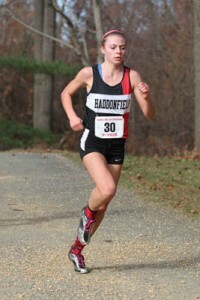 We’ve also added the list of All Time performances under 19 minutes the 50 Returning Girls Holmdel Park performances from last year and the top 50 Holmdel Park returners. Our coverage of this year’s “Mid term Exam” will continue all week. * “D” Race – Add Buena Reg., Holy Angels, Red Bank Reg. There is a championship race with seven girls teams because???????? And 31 teams in the varsity girls a race is a good idea because???? This entry was posted on September 28, 2014 by Patrick Montferrat in 2014 Cross Country.